rec. January 2008, Centro de Acción Social por la Música, Sala Simón Bolivar, Caracas, Venezuela. DDD. It’s taken me a year to catch up with this recording, which Dan Morgan made Recording of the Month in May, 2008: ‘Definitely one of my discs of the year’ (see review). Better late than never, however. From the opening of Sensemayá, which I’ve never heard sound so mysterious, on the first track, to the exultant Mambo from West Side Story which ends the programme, everything here is purely delightful. With very acceptable mp3 sound for about half the price of the CD, this download is well worth having. 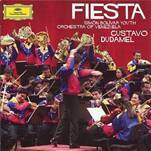 Some of the music is available in other versions – Sensemayá, for example, more cheaply on Naxos 8.555917, and as a download from classicsonline.com and passionato.com – but these performances by the Simón Bolívar Orchestra and Gustavo Dudamel are good enough to see off any competition. If you haven’t yet bought the CD, don’t put off obtaining this recording for another year. With just six tracks, this is the sort of recording that eMusic does best – for a total outlay of less than £1.50 you can afford to download and decide whether or not the music appeals. If you know anything by Hovhaness, you’ll have a fair idea of the kind of colourful blend of Western classical music and Eastern music on offer. The picture of Mount Fuji on the cover will give you an extra hint but Rob Barnett’s recent review of the parent CD will give you a more detailed indication. Although Rob knows much more about Hovhaness than I do and gives chapter and verse on the music, we’re both a little in the dark when it comes to comparing the performances – three of the four works are first recordings and the fourth, Floating World, has never before been recorded in full, so there are no bench-marks. The performances sound pretty good to me and the recording is more than acceptable in the mp3 format; I very much enjoyed it all. Full marks to Centaur and to Chung Park, who produced the recording as well as conducting, for initiative in offering works not available even on the Crystal label. If you wish to explore Hovhaness further, classicsonline have a number of recommendable single CD and 2-CD recordings on the Delos label – more next month. Isaac was highly thought of in his own day and, though his reputation has diminished since, this recording shows us why his contemporaries held him in high esteem. He’s certainly too good to be remembered only for short pieces such as his setting of Innspruck, ich muß dich lassen, the tune of which is surprisingly similar to Bach’s oft-used setting of O Haupt voll Blut und Wunden. The performances and recording are fully commensurate with the high expectations encouraged by Gimell’s other recordings. When reviewing the recent version of the Musical Offering by Concertante of London/Nicholas Jackson (SOMMCD077 – see review), I was about to sum up by saying that the new version was very enjoyable but that Neville Marriner with the Academy of St Martin (Philips Duo 442 5562, with the Art of Fugue) offered better value, when I decided to throw this Virgin recording into the ring for comparison. Ensemble Sonnerie offer only the Musical Offering, but, with varied instrumentation, including alternative takes for some of the movements, they run to 72 minutes. There’s no organ, as on the ASMF version, just Gary Cooper on the harpsichord, so some of the magic of Kraemer’s opening ricercar on Philips is lost, but this is a very sensitive opening and my ear didn’t crave anything more colourful. The promise of the opening is kept throughout the recording. Not content to stay with the instrumentation required for the Trio Sonata at the heart of the Offering, Ensemble Sonnerie employ flute, two violins, viola, oboe d’amore, oboe da caccia, harpsichord, bassoon and viola da gamba. The players are all distinguished: Wilbert Hazelzet, Paul Goodwin, Frances Eustace, Monica Huggett, Pavlo Beznosiuk, Sarah Cunningham and Gary Cooper. They place the Trio Sonata on tracks 12-15 out of 17, with just the repeat of the canon perpetuus and the ricercar a 6 to round off the performance. They allow that final ricercar even more time than the ASMF players, at 8:28, and the result is most impressive. I’m now inclined to rate this the best version of the Musical Offering that I’ve ever heard; it raises all the music to a level of enjoyment that I’d derived only from the Trio Sonata before. The Virgin recording is first-rate, placing all the instruments clearly, but not over-analytical. I downloaded the lossless flac version from passionato.com and found it excellent; there’s also a less expensive 320kbps mp3 version. At full price, then, or as a download, my recommendation is Ensemble Sonnerie on Virgin. The new Somm version is well worth having at mid price, especially if you find the two extra works attractive. The Marriner/Academy version on Philips Duo is less of a bargain as a download – more expensive than the parent CD set. Most collectors probably begin with the two sets of London symphonies, Nos. 93-104. My own first LP of Haydn was the mono Beecham version of Nos.93 and 94, a Columbia recording reissued on the Philips Classical Favourites label. The classic modern versions of these symphonies come on two Philips 2-CD Duo sets, from the Concertgebouw Orchestra, conducted by Colin Davis (442 611-2 and 442 614-2). You can obtain these as downloads from passionato.com but, at £15.99 each, they’re considerably more expensive than their CD equivalents, widely on offer from online dealers for around £9 each. Otherwise, the recommendations below contain several of the London symphonies. We don’t normally think of Haydn as a composer of keyboard concertos – indeed, not all the works that have masqueraded as such are authentic Haydn – but this award-winning CD of three genuine works demonstrates that they are well worth hearing. Andsnes plays with the utmost delicacy without making Haydn sound like a fragile precursor of Mozart and Beethoven. Everything is just right here and the flac download is excellent. The only problem is that this recording has recently been reissued on the mid-price EMI Recommends series, on offer from some online dealers for less than the £7.99 which passionato charge for the mp3 and much less than the £9.99 for the flac download. This account of Concerto No.11 was chosen for inclusion in full on Leif Ove Andsnes – a Portrait (5 74789-2, 2 CDs, no longer available? ), which John Philips recommended as ‘an excellent issue’. My colleague Don Satz wrote that this was ‘a fine alternative to the full-bodied Rostropovich performances. Both Capuçon and Harding offer lean and incisive performances of Haydn’s vibrant concertos. With the added virtues of an exceptional period cello and crisp soundstage, the disc is heartily recommended to all Haydn and period instrument enthusiasts’. (See review). There’s little that I need to add, except to say that the flac download sounds as entirely truthful as DS found the CD to be, apart from some slightly off-putting occasional ‘breathing’ sounds, especially in the second concerto, which I take to be emanating from the soloist or his instrument. No problems price-wise, either, since both the mp3 and flac downloads are significantly cheaper than the parent CD – excellent value, in fact. I might have preferred the Boccherini concerto which has frequently been the companion to one or other of the Haydn concertos on record - preferably not in the version bowdlerised by Grutzmacher which du Pré on EMI and Kanta on Naxos offer - instead of the spurious ‘Haydn Fourth Cello Concerto’ here, but it’s an attractive enough work. Capella Istropolitana/Barry Wordsworth rec.1988, DDD. Capella Istropolitana/Barry Wordsworth - rec.1990, DDD. I’ve tried to include a cross-section of Haydn’s symphonies here – impossible, of course, because they are all so individual, but this could be the start of a worthwhile collection. Barry Wordsworth’s contributions with the Capella Istropolitana are among the best of the now complete Naxos series. I’ve included named symphonies from the Sturm und Drang period, the visit to Paris and the two visits to London, in order to offer variety. I’m not going to quibble about the use of named symphonies as convenient pegs on which to hang the programme – very few of these nicknames emanated from Haydn himself – or the description of No.96 as the Miracle, though modern scholarship inclines to No.102 as the symphony which the audience moved forward to applaud, thus avoiding the crashing chandelier. Nor is No.94 the only work by Haydn to employ a surprise – listen to und es war Licht (and there was light) from The Creation for an even bigger crash; this one was apparently designed to make the ladies in the fashionable London audience wake up and resort to their smelling salts. Nicholas Ward also made some excellent contributions to the Naxos complete edition, of which this version of Nos. 23, 24 and 61 is a fine example. Just try the adagio second movement of No.24 (tr.2) for some beautifully delicate music, very sensitively performed. The flac recording is good. I hope to include some more of these NCO/Ward recordings next month. If anything, the two recordings which I’ve included from Thomas Fey’s complete Hänssler set are even better. If you can go for only one, make it the CD of Nos. 70, 73 and 7, a Musicweb International Recording of the Month – see review. Like the Wordsworth recordings, these two may be taken as typical of a very fine series from which I hope to hear and report on more in future Download Roundups. All the mp3 transfers, Naxos and Hänssler alike, are very good. Kodály Quartet - rec,1989, DDD. Naxos also have complete recordings of the Haydn String Quartets from the Kodály Quartet, available separately or recently reissued as a box set (8.502400 see review). These three discs of his late masterpieces are fully recommendable, apart from the rather mean playing time of the Op.77 pair. You’ll note that I’ve sampled some downloads from passionato.com (flac lossless) and some from Naxos’s own site classicsonline.com (320k) and both are good. eMusic in mp3 at variable bit-rates. Classicsonline’s 320k recordings (£4.99) are more than adequate and, with Naxos’s more recent recordings, the booklet and insert come as part of the deal. When flac becomes available, audiophiles will find it worth going for, though at a premium, which I understand will be one US dollar/euro or 90p. Passionato already offers audiophile-friendly flac versions, though, at £5.99, this makes them at least as expensive as the CD equivalent and a little dearer than classicsonline. Their mp3s (£4.74) come at the same bit-rate as those from classicsonline, at a small but significant saving over all their competitors. Theclassicalshop’s downloads at £5.20 seem over-priced by comparison with the two other providers at this bit-rate. Amazon and iTunes downloads automatically transfer themselves to the iTunes jukebox if you have it installed. Their 256k bit-rate is already beginning to look outdated when others offer 320k and when passionato offer 320k for £4.74. Amazon’s standard charge ranges from £4.89 to £5.99, but some albums are much cheaper – for example, the Kodály Quartet’s version of Haydn’s Op.71/1-3 comes at a very inexpensive £2.96. iTunes charge £4.74 for their limited selection of Naxos; some albums are not available in complete form and none of these Haydn recordings are on offer from them. Haydn originally composed this music, for performance in Holy Week in Madrid, for chamber orchestra, with spoken interjections before each of the musical responses. It’s best known nowadays in its string quartet arrangement, of which there are numerous good recordings, not least that by the Kodaly Quartet on Naxos, available to download from classicsonline.com. This version from the Fitzwilliam Quartet has the advantage of using authentic instruments and employing slightly faster tempi than usual, for reasons explained in the fine booklet of notes, available to download in pdf format and to print out, with some striking artwork. Missa in tempore belli (Paukenmesse); Missa Sancti Bernardi von Offida (Heiligmesse) (1796); Insanæ et vanæ curæ (1809)Soloists; Monteverdi Choir; English Baroque Soloists/John Eliot Gardiner – rec. 2003, DDD. In an earlier Roundup I recommended the Chandos/Hickox recordings of all Haydn’s Masses. There are, however, alternatives to be considered, not least the DG Archiv recording of the ‘Nelson’ Mass which I recommended last month, an ADD recording which still holds its own against all comers. More recently John Eliot Gardiner recorded the last six masses for another branch of the Universal Classics empire. His version of the Mass in time of war, usually known by its German nickname Paukenmesse, and the almost equally rewarding Heiligmesse are well worth considering. The coupling is a motet, Insanæ et vanæ curæ, rescued from the oratorio Il ritorno di Tobia (see below) with Latin words replacing the Italian. Don’t be put off by Philips’ note that this is spurious – there’s no sound reason not to believe that Haydn himself adapted the music. Excellent performances all round and very acceptable mp3 sound. Roberta Invernizzi (sop), Sophie Karthäuser (sop); Ann Hallenberg (alto); Anders Dahlin (ten); Nikolay Borchev (bass); Volksensemble Köln; Capella Augustina/Andreas Spering – rec.2006, DDD. Like the pastiche oratorio Tobit, composed after his death from various pieces of music by Handel, which I included in my April, 2009, Download Roundup, Haydn’s first work in this genre tells the story of Tobias’s journey to find a cure for his blind father, his return and his father Tobit’s subsequent cure. Though it’s something of a Cinderella among Haydn’s works, it has received two recent recordings, this and one from Hungaroton (HCD11660-2), also available from classicsonline. The Naxos recording does the music full justice, with no really weak performances, apart from minor reservations about Anders Dahlin. It’s well recorded and well transferred in 320k format. Roberta Invernizzi’s Raffaele steals the show, as one might expect from her singing on the Glossa recordings of Handel’s Italian cantatas (see March, 2009, Roundup) but nothing is ever less than very satisfactory, including the chorus in the two additions which Haydn made in the revised score of 1784. Download from Naxos’s home site at classicsonline and you’ll get the booklet to download and print out; it contains the full Italian text but no translation is offered. For further details see review and review. There’s no download equivalent of the bargain box of 30 CDs, superb value for the price of 3 discs, but readers who have some of the recordings already may like to be reminded of the virtues of some of the individual recordings which they don’t own. I’ve taken most of these downloads from Chandos’s own theclassicalshop.net, where they are all available in 320k mp3 and in a variety of lossless formats, wav, wma, aiff and now flac. Passionato.com also have many of these recordings in 320k mp3 and flac versions, so I’ve included some of these. Both suppliers charge £7.99 for mp3 and £9.99 for lossless, but only theclassicalshop.net allows you to download and print the booklets. For an overview of the complete set, see Rob Barnett’s review. Texts included as pdf. document. This was the first of a highly successful series of recording of the masses of Hummel. If you like Haydn’s masses, you’ll also enjoy those of his successor at Esterháza in these excellent performances. The very good recording sounds very well in the lossless transfer and Chandos also offer the excellent book of notes and texts to print out. Don’t be surprised if this recording makes you want to move on to the other volumes in the series and/or a fine Naxos recording of the Missa solemnis. London Mozart Players/Matthias Bamert – rec.1998, DDD. This was one of the earliest recordings (1998) in this excellent series – I recently recommended two of the latest volumes, of Leopold Mozart and Vogler in last month’s Roundup. Vanhal is one of the most distinguished contemporaries of Haydn and Mozart; had I heard the opening g minor symphony on the radio and guessed at the composer, I might well have thought it one of Haydn’s Sturm und Drang symphonies or even early Mozart. LMP and Matthias Bamert make an excellent case for these three symphonies – good enough to tempt anyone downloading it to try one or more of the Naxos CDs of Vanhal’s music, available to download from classicsonline.com or passionato.com. Passionato’s flac version of the Chandos recording is excellent. Vanhal is known to have performed quartets with Haydn and Mozart. The fourth member of that ensemble, Carl Dittersdorf, is also worth getting to know – try his Six Symphonies after Ovid’s Metamorphoses from Cantilena/Adrian Sheppard on Chandos CHAN8564. Download these from theclassicalshop.net; for some inexplicable reason, passionato charge as if for a 3-CD set, whereas theclassicalshop offers each of the two CDs separately for £7.99 (mp3) or £9.99 (lossless). Craig Ogden (guitar); Alison Stephens (mandolin) – rec.1999, DDD. I thought this the least enjoyable of the recordings which I downloaded from the Milestones set. The music is all very enjoyable and the performances and recording are admirable, but I found the whole thing just too bitty, apart from the opening arrangement of a Vivaldi concerto. I’d have liked to hear the whole of the Hummel concerto, for example, instead of just the one movement. There would (just) have been room to include it. Don’t be put off by the similarity of the first trio to Tchaikovsky’s better-known Piano Trio. There certainly is a large degree of imitation but there is also more than a hint of the Rachmaninov to come; though this student work was not published until after the composer’s death, it’s certainly worth hearing. Trio No.2, composed as a lament on the death of Tchaikovsky, is a more accomplished work. Both receive eloquent performances from the Borodin Trio and the recording sounds very well in lossless form. There is a rival Hyperion version from iTunes; it’s more generously filled, but that would be the only reason not to go for this Chandos download. Chandos themselves also have a rival version from the Bekova Sisters, deleted on CD but available to download from theclassicalshop.net. I haven’t heard this but I can recommend the Bekova Sisters’ coupling of Ravel’s Piano Trio in a, Sonata for violin and cello and Martinů’s Piano Trio and Duo (CHAN9452 and downloads in mp3 and lossless formats). I recommend this more for the sake of the Martinů – another of this year’s anniversary boys – than for the Ravel, of which there are more obviously recommendable accounts. CHANDOS MOVIES CHAN10007 [78:30] – from the classicalshop.net (320k mp3 or lossless). It’s fascinating to hear the building blocks of the Sinfonia Antartica, which grew out of the film music for the film Scott of the Antarctic, especially the leitmotiv of the film and symphony, though it’s a little frustrating when it isn’t developed as fully as it came to be in the symphony. This was the first recording of some of the music from the film and, to the best of my knowledge, there’s still no complete rival, which makes this download more recommendable than the otherwise fine Marco Polo version of Coastal Command from passionato.com. Ian Lace thought this Gamba recording “an excellent introduction to the evocative film music of Vaughan Williams, especially important for presenting the full score of Scott of the Antarctic. Thrilling, evocative performances captured in the best Chandos sound.” (see review). The Milestones box also contains Richard Hickox’s superb recording of the original version of VW’s London Symphony, an urgent recommendation in one form or another – see review. The CD is superb and I have no doubt that Chandos’s own lossless version from theclassicalshop.net is its equal, with the less expensive 320k mp3 a very acceptable alternative. Though my allegiance to David Oistrakh’s various recordings remains undiminished, this 1989 recording offers very fine performances in unquestionably better sound. I’ve even seen it claimed that Lydia Mordkovich’s performance of the second concerto makes it sound almost the equal of the first. I wouldn’t go that far, but she and Järvi, ably abetted by the RSNO before they earned the ‘Royal’ tag, certainly made me take much more notice of a work which can seem something of an anti-climax after the powerful first. Supplement this recording with an incredible 3-CD bargain on the Documents label, 7620, with Oistrakh playing the two violin concertos, coupled with very decent versions of the cello concertos (Alexander Ivashkin) and piano concertos (Cristina Ortiz), all for less than £9. The music contained in MS Brussels 5557 seems to have been connected with the lavish marriage of Charles the Bold of Burgundy and Margaret of York, sister of the English King Edward IV, in 1468. Hyperion have recorded two masses by Walter Frye contained in the manuscript, together with music by his Burgundian contemporary Antoine Busnois, a splendid CD, which I can recommend very highly (CDA67129, The Binchois Consort – see review). This Signum recording of two other masses from the collection, by Frye again and his contemporary John Plummer, together with some shorter secular pieces, is equally recommendable; indeed, I’m not sure which I’d go for first. Perhaps you should begin with the Hyperion, which has the usual lavish booklet of notes about the Brussels MS, before downloading this Signum CD which, of course, comes without notes. Short of a lossless version, not currently available, though classicsonline are about to offer some downloads in flac format, this mp3 recording could hardly be bettered. In fact, I can now confirm those first impressions and recommend this as an alternative to the Purcell Quartet on Chandos. Symphony No.3 (Scottish); Symphony No.4 (Italian); Overture The Hebrides (Fingal’s Cave). Classic performances from a boxed LP set which appeared in the 1970s, still sounding well in this mp3 transfer, though I recommend setting your listening level slightly lower than usual: the ADD transfer is at rather a high level and, if played too loud, shows up a slight tendency to sound less than ideal at climaxes. Karajan is cavalier with repeats, hence the generous coupling, but the performances more than atone. This is the only version of the Scottish which I’ve ever heard that didn’t make a distinct and disconcerting gear-change at the beginning of the coda to the finale. Like Rob Barnett, I felt that charm suffered in parts of the Italian (see his review of that symphony and The Hebrides on a 2-CD Panorama set) but I thought that overall the merits outweighed the slight disadvantages. Even if you buy the Karajan recordings of the Scottish and Italian symphonies, there’s room for this Naïve recording, though it involves duplication. Krivine offers really lithe playing from his original-instrument ensemble – tempi are brisk but never unduly so. On paper, Krivine’s 10:06 for the opening movement of the Italian looks staid by comparison with Karajan’s 8:09, but Krivine is more generous in the matter of repeats and he captures the charm better than Karajan. No other recording of the second movement has ever reminded me so much of the pilgrims’ music in Berlioz’ Harold in Italy. Like Michael Greenhalgh, I recommend this as the authentic version to go for. Like him, too, I prefer original instruments in this music – see review – though I wasn’t sure what the chairs on the cover signified. This recording is also available from iTunes. Though I’m not the greatest fan of the large-scale romantic piano concerto, I enjoyed this recording very much; Shelley stresses the delicate moments as much as the bigger statements and the iTunes 256k mp3 transfer is very acceptable. I’ve recommended this recording at greater length in the main pages of Musicweb International – see review. London Philharmonic Orchestra; Philharmonia Orchestra/Nicholas Braithwaite – rec. c.1990? ADD? I wasn’t quite as bowled over as my colleague Raymond Walker by this recording of music by an English composer whom Mendelssohn took under his wing (“Wow! What an enjoyable disc” – see review). Rob Barnett was a little more subdued, but also very appreciative – see review. This is very attractive music with palpable echoes of Mendelssohn – albeit a slightly sober Mendelssohn – and his contemporaries. RW warns against being put off by the stern picture of the composer on the cover, with cane-sized baton in hand; maybe I was a little too influenced by it, but the experience was sufficient to tempt me now to sample Lyrita’s two CDs of Sterndale Bennett’s piano concertos. The recording in mp3 format is not quite up to the high standards of the CD, as reported by RB’s and RW’s reviews, but it is very acceptable. If the performance of Mambo which ends Gustavo Dudamel’s recording Fiesta, my Download of the Month, has inspired you to listen to the whole of West Side Story and you find the DG version directed by Bernstein himself too operatic, try this inexpensive Naxos download from classicsonline. There are no big names here, but I don’t think you’ll be disappointed.